The system will link prescribing data in primary care to hospital admissions to help the NHS monitor and prevent errors. A groundbreaking system to help the NHS monitor, learn from and prevent costly medication errors has been launched today. As part of the Health and Social Care Secretary’s plan to make the NHS the safest healthcare system in the world, the NHS will introduce a series of indicators to show whether a prescription may have contributed to a patient being admitted to hospital. The indicators will work by linking prescribing data in primary care to hospital admissions. This will allow the NHS to monitor and better understand medication errors, with the aim of preventing them from happening. The first indicators will focus on how different medicines may be contributing to people being admitted to hospital with gastro-intestinal bleeding. The programme will cover more medicines and associated conditions later in the year. The launch of the new system follows research which highlighted the impact of medication errors, with an estimated 237 million taking place every year. "Today marks a vital step on our journey towards making the NHS the safest healthcare system in the world. While our own research has shown us the shocking toll medication errors take on our health service and its patients, the NHS itself needs a consistent way to measure medication errors. This groundbreaking initiative will help give us the data we need to stamp out these costly errors." The indicators will work alongside other measures designed to reduce medication errors and encourage openness and transparency, such as new defences for pharmacists if they make accidental dispensing errors. 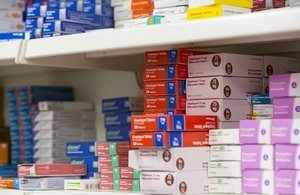 Plans also include accelerating the introduction of electronic prescribing systems across more NHS hospitals this year. Through this innovative programme of work, the NHS is leading the way in responding to a global issue which the World Health Organisation has described as “a leading cause of injury and avoidable harm in healthcare systems across the world”.